Still swimming, and loving it. I am swimming about twice a week, and feeling better with each swim. My friend from the Y is going to start teaching me flip turns.... yikes. This will be nice. I feel like such a newbie (OK I am a newbie) when I touch the wall and turn like a child. hee hee. My little Beagle (Nellie) got super sick a couple of weeks ago. She spent the night in the doggie hospital and they never really knew what was wrong with her. A few night later she got even sicker and started vomiting blood and even had it in her diarrhea. Poor baby. She is doing better now. Pretty sure it was something like "Gastritis" (sp?) She is doing better and I am looking forward to warmer, dryer days when she can run with me again. My left foot has been bothering me. It's right where the toes bend. I think it is wanting to be a stress fracture, but I am hoping with new shoes and babying it, things will get better. :) Rest.... what's that? great shoes! hope it is nothing serious with the pain. have a good swim...i am so happy for you. I am off to find some new shoes tomorrow! I can't wait. Here's hoping Nellie is on the mend, poor thing. Poor doggie! I hope that she continues to get better! Great to hear that you are keeping up with your new swimming routine! I hope you feel better soon and that your foot is nothing to worry about. i'm glad the pup is feeling better. watch that foot...don't let it get any worse. Poor pup. Glad she's doing better. I've seen so many cute pink shoes this season! I'm totally going pink, too. 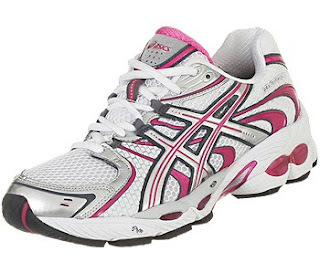 I love my Asics Gel-Landreth but I may just have to switch it up. Hope you left foot feels better soon. REST!! !